For people between 15-50 years old. The stresses and strains of modern life can take their toll not only on our psyche, but also on each of our delicate gut bacteria balances. This is why replenishing microflora be so beneficial when it comes to getting the most out of our nutrition – better absorption for more energy, feelings of wellbeing and vitality. Each vegetarian capsule contains: 17 billion viable cells at time of manufacture and at least 10 billion viable cells at expiry in a base of potato starch, ascorbic acid, stearic acid, and silicon dioxide. Supports and maintains healthy intestinal flora during and following a course of antibiotics. Lactobacillus casei (HA-108) : 35%, Lactobacillus rhamnosus (HA-111) : 25%. Lactobacillus acidophilus (HA-122) : 20%, Lactobacillus plantarum (HA-119) : 10%, Bifidobacterium bifidum (HA-132) : 5%, Bifidobacterium breve (HA-129) : 5%, potato starch, ascorbic acid, stearic acid, and silicon dioxide. Capsule: Hypromellose. Store refrigerated at all times. Can be frozen to prolong shelf life. Keep out of reach of children. Gluten free. Safe to take while pregnant and breastfeeding. Below are reviews of Udos Choice Adults Blend Microbiotics - 60 Vegicaps by bodykind customers. If you have tried this product we'd love to hear what you think so please leave a review. Classy top up for your friendly bacteria. I take them at night so that they have time to get in & flourish! Seems to do me good. Udo’s Choice Adult’s Blend Microbiotics contains 6 adult-specific bacterial strains at an appropriate strength, designed specifically to reflect healthy adult microflora. 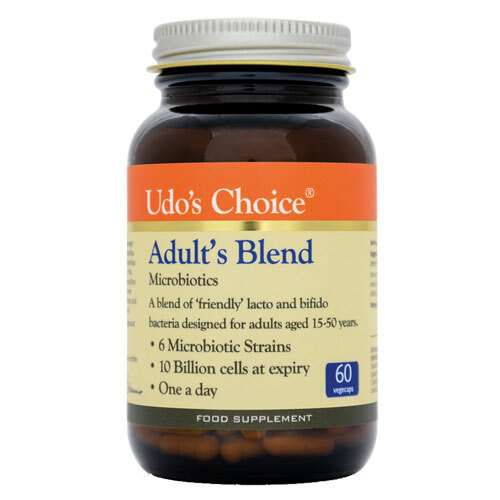 The specific strains used in Udo’s Choice Adult’s Blend have been specially chosen for their value to adult health.